Most animals have some sort of predator, whether it's wolves, lions or sharks. The young and elderly animals typically are more vulnerable than healthy adults; young ones can't run as fast, and they haven't developed the strength to fight off predators, for example. Some animals defend their young by forming protective circles around them when danger threatens. Size isn't always enough to protect animals from predators, especially in areas where food can be scarce, such as the Arctic. Musk oxen, for example, can reach more than 900 pounds, but they still fall victim to predators such as wolves – especially young musk ox. To protect their young, adult musk oxen form a circle around them, with their sharp horns facing out. Adults can scoop up wolves with their horns, piercing their skin to injure or kill them, and they throw them down to trample them. Land animals aren't the only ones who can circle. 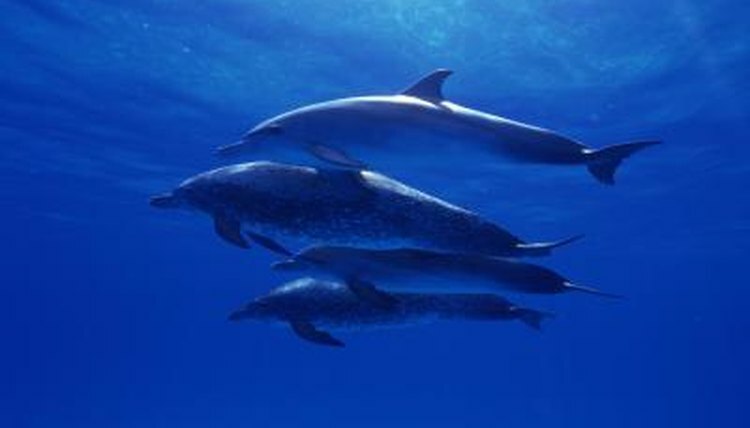 Aquatic creatures such as dolphins use circling techniques to keep their babies safe. When the young ones are playing, dolphin moms and aunties swim in a circle around them. This keeps the young contained so they can't swim into danger, and it lets the adults keep a sharp eye out for signs of trouble. Dolphins tend to flee when sharks arrive, for example, but they've been known to fight back, giving the sharks powerful punches with their snouts. The plains of North American can be a dangerous place, even for powerful creatures such as bison. They face predation mainly from wolves and mountain lions, who prey on the weak and the slow – like young bison. Bison typically run when they sense danger, but when predators approach without warning, bison form a multilayer circle of protection. The females form a ring around the young, and the males form an outer ring surrounding the females. Their large, strong heads topped with horns and fast hooves often are enough of a deterrent to send predators elsewhere, although bison aren't afraid to fight back if the predators decide to attack. The African savannah supports many large animals, including the African elephant. This creature might seem too large to fall victim to predators, but many young are attacked by animals such as lions and hyenas. These predators aren't much of a match for a full-grown elephant, so when a matriarch leader senses danger, she herds the young together and the other group members form a protective circle around them, usually several layers deep. Their sharp tusks and heavy feet often send predators to seek easier fare. Are Zebra Foals Born Striped? How Much Does a Fully Grown Zebra Weigh? What Kind of Shelter Does a Cheetah Have?